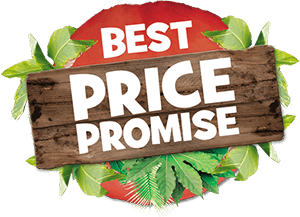 If you can find exactly the same Chessington World of Adventures Resort ticket and accommodation package cheaper within 24 hours of confirming your booking with us, we will refund the difference to ensure you have paid the best possible price for your break (subject to the few applying terms and conditions listed below). Reclaiming your money is really easy: Simply call us on 0871 360 2639 and let us know the details of your claim. We will look into it and give you a decision within 3 working days. If you think you have found the same package cheaper elsewhere, call us on 0871 360 2639. NOTE: Landline calls cost up to 13p per minute plus your telephone provider's access charge, if applicable. Calls from mobiles and other numbers may vary. Please ensure that the package you are comparing against is identical in all respects and that it meets the terms set out below. ANY VARIATION MEANS WE CANNOT MATCH THE PRICE. 1 - You are entitled to compare against a ticket and accommodation package provided by another supplier or against a ticket and accommodation package assembled by yourself. In both cases, the price you are comparing against is the overall price of the package. 2 - The package of products under comparison must be the same in every respect as the one you purchased from Holiday Extras, in particular: (a)- the accommodation element of your package must be like for like with your Holiday Extras package including, without limitation, the same hotel or other type of accommodation, same dates, same room type, same board basis and same cancellation terms; (b) - the ticket element of your package must be like for like with your Holiday Extras package including, without limitation, the same number of days entry to the park, same number of people, same date of entry and the same child age ranges. 3 - Holiday Extras tickets can sometimes be purchased on an offer of Buy one day, get one day free. In this example we would price match against an equivalent amount of days entry to the park e.g. a 2 day entry ticket. 4 - Where multiple rooms are booked each room is regarded as a separate product. 5 - You must make your claim within 24 hours of making and paying for your booking with Holiday Extras. 6- Your Holiday Extras booking for the package of products must have been paid for in one transaction. 7 - Successful claims will not be paid until after the return date originally booked. 8 - You must use the package of products as per the booking against which you are making your claim. 9 - Cancellation of the booking cancels your right to claim under this guarantee. 10 - Comparison prices must be listed and quoted in pounds sterling. 1 - Prices from other suppliers conditional on buying other products. 4 - Prices that are part of any other discount or special offer deal. NOTE: When calculating we consider only the overall price of the package of products, not any additional fees e.g. amendments fees.